Rates for Seabreeze Self Catering Studio are fully inclusive of electricity, central heating; WIFI, TV, DVD, bikes and October to April bus passes are included too! (But exclude travel and car hire). A welcome pack including coffee, tea, milk, bread, soup, ham, butter and cheese will be in the apartment when you arrive. May to the end of September bookings are controlled and can only be made via Tui Ferienhause add Seabreeze Guernsey when you reach their site this is where prices and availability can be found. Click on ‘translate’ to get the English version. Ask us if you get a problem. Only Bookings October to April 30th can be made direct with us in advance but sometimes there are a few gaps in summer we can fill last minute so do ask us. 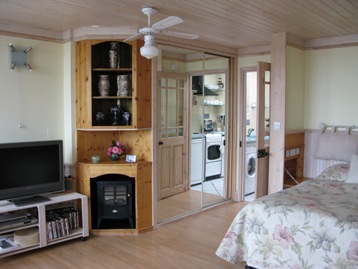 We offer bed and breakfast in the main house as an alternative too (for details and rates click on Seabreeze B&B. Or there is a three day minimum stay at Seabreeze Studio. There is a supplement of £100 for any bookings over Christmas or Easter at Seabreeze Studio. Please check on the Seabreeze Availability page which only shows red the days all rooms are fully booked.